I’m always looking for the new it heel and thanks to Blue & Cream I think I’ve found it! 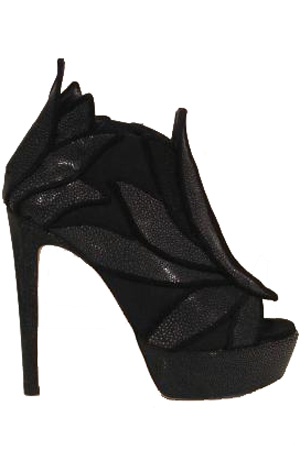 Chrissie Morris, a designer from Paris, doesn’t create a shoe, she creates art. In Jeff, owner of Blue and Cream’s words, she creates collectible pieces to wear, but also to be admired. When I stepped into my first pair of Chrissie Morris heels it was love at first sight. Some people crave design over comfort, but in these heels you can have the best of both worlds with no need for sacrifice. What at first I mistook for a mere pattern I soon learned was snakeskin and stingray skin, adding an adventurous edge to the glamourous shoe. Wearing the Chrissie Morris Audrey with a Charlotte Ronson dress and casual denim jacket took the whole look to a new and much chicer level, perfect for a celebration dinner. Each Chrissie Morris design has a unique feel that’ll have your shoe wardrobe stepped up in no time, if of course you’re willing to pay the pretty penny, xo. I would have to just look and not walk – too high!